You might remember that I read a different Morton title last year. After completing that read, I was really on the fence about her writing. I did find Morton to be a fascinating storyteller but I had some concerns about the content. At that time, a couple of you encouraged me to give her another try. Melissa recommended that I try out The Secret Keeper . I trust Melissa's opinion and so I tucked that suggestion away for whenever a good opportunity might present itself. My mother-in-law and I share a Kindle and, as it turns out, she had a copy of The Secret Keeper on there. When I was flat out sick a few weeks ago I decided that was a perfect time to dive into a fun story and I knew that, if nothing else, Morton would prove diverting. She was! 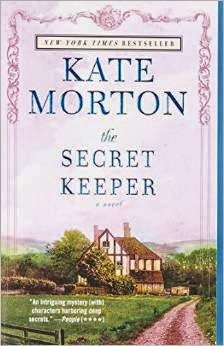 The Secret Keeper improved my opinion of Morton as a fun author, mostly because I didn't have any hiccups and hesitations due to implied sexual scenes like those which existed in the other title. The Secret Keeper did contain one particular implied scene but instead of being able to see it coming I actually had to re-read the passage to see if I was really reading what I thought I was reading. (And I was. So yay I re-read that. Blah.) It was much more discrete though and I appreciate that. As to foul language, again I find myself unable to comment on that because unless it's super prolific, I tend to ignore its existence. (By this I mean that if a word appears more than twice, I generally notice. But less than two times and I'm liable to forget.) I don't recall anything, but that doesn't mean a word or maybe two was scattered about. As Melissa had told me, this story is set into a World War II time frame which I definitely enjoyed. I'm going to steal the description from Amazon on this one primarily because, as the title suggests, this book is full of secrets. "During a picnic at her family’s farm in the English countryside, sixteen-year-old Laurel Nicolson witnesses a shocking crime, a crime that challenges everything she knows about her adored mother, Dorothy. Now, fifty years later, Laurel and her sisters are meeting at the farm to celebrate Dorothy’s ninetieth birthday. Realizing that this is her last chance to discover the truth about that long-ago day, Laurel searches for answers that can only be found in Dorothy’s past. Clue by clue, she traces a secret history of three strangers from vastly different worlds thrown together in war-torn London — Dorothy, Vivien, and Jimmy — whose lives are forever after entwined. A gripping story of deception and passion, The Secret Keeper will keep you enthralled to the last page." This book will definitely keep you enthralled to the last page. As you skip back and forth from the 40's to the 60's to the present day you will be on the edge of your seat wondering how all of these lives intertwine. You might think you know, only to discover that you don't. I love that the book kept me guessing all the way to the very end. If anyone is wondering, yes, I will read another Kate Morton book in the future. (There's another one on the Kindle just waiting for me!) I'm saving it like chocolate on a high shelf. I had similar concerns about the one book of hers that I have read. Loved the writing but was so dismayed about some of the content and language that I was turned off about reading her again. I still don't know if I want to read her again but am glad to know there's a clean option if I do. I have a book of hers in my book basket but can't remember which one anymore. Hope it's this one.